From the Traxter to the Outlander and Renegade, Can-Am has created some of the most exciting and forward-thinking ATVs on the market for decades. With a focus on power and control, these rides are the perfect mix of fun and function sure to please any rider. We offer a diverse selection of parts for this fan favorite so your customers can get back in the action! Whether looking for a drive shaft or a cylinder head for the Maverick, Defender, or Commander model, we have your shop covered. Find affordable solutions of the highest quality to get the performance your customers deserve with their next ride. There is a lot in a name. When the name Can-Am comes up, it conjures images of riding rough terrains with complete control and agility to rival any manufacturer on the market today. With a long history of excellence and performance standards that set a high bar, this manufacturer continues to introduce vehicles made to excite with every ride. When looking for the best in Can-Am OEM parts for your repair shop or business, we have your customers covered with all the must-have solutions for their favorite set of wheels from this trusted name. The Can-Am brand technically planted roots in 1942 under the BRP umbrella corporation. The BRP company was always on the hunt for the next big thing to excite riders from all walks of life. With a focus on expanding the BRP name to include off-road vehicles, they introduced their first ATV in 1972 after years of tinkering with the design and would continue to produce new models with thoughtful innovations while setting the industry standard on a new course. Designed and manufactured with attention to every detail to ensure performance, speed, stability, and safety, Can-Am ATVs are still a fan favorite for riders of all ages and preferences. 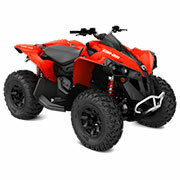 Whether looking for an ATV for rugged trail riding or one for working, this manufacturer meets a wide range of needs with features such as some of the best suspension in the industry boasting independent rear suspension to improve vertical wheel control, Rotax power to lead with power transfer and traction in the front of the ATV, engines made to handle the roughest conditions and terrains with ease thanks to the responsive throttle and Rotax engine components working in unison, and other smart features. When ATVs were rolling over on riders, Can-Am made their models wider and added more control on the turns. When ATVs were struggling to tow higher load capacities, they redesigned their chassis and overall design to increase it to an impressive 1,650 standard in most models. Their models are the epitome of innovation in action. While their all-terrain vehicles are impressive, their side by sides deserve equal recognition. Made with many of the same high-powered features as the ATVs, these utility vehicles are made for work or play with a focus on power and control. Whether a rider is looking to get around on the farm with ease or take on a few trails for fun, this manufacturer has a utility vehicle for any preference. 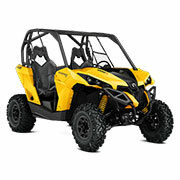 We are honored to bring you a diverse selection of Can-Am OEM parts for your shop or business. We understand that in order to find the right solution for the desired outcome of the vehicle, you need a wide range of choices to safety your customers. Our inventory features years ranging from 1999 all the way to the most current vehicles. We also feature a wide range of vehicle models and series within each model to help dealers and repair shops get the exact part the machine needs to perform at peak performance levels. When shopping our selection of Can-Am OEM parts, you will also find a diverse range of areas covered from spark plugs to frames. Whether shopping for engine components, air intake manifold, pistons, or gear shifts, we have the needs of your customers covered with all the essentials all in one convenient place. Best of all, we offer Can-Am OEM parts which are direct from the manufacturer to further ensure a proper fit and performance outcome for their vehicle. We also have no minimums on orders to help dealers keep their overhead low. If you have any questions about any of the high-quality solutions we proudly offer, please contact us for further assistance today. We are always happy to help our valued customers!